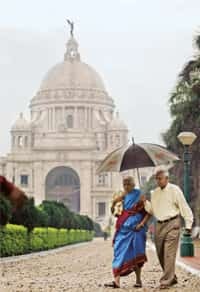 The demographic curve and a still high fertility rate mean that India, unlike China, for example, does not face the prospect of an ageing population anytime soon. So there is no urgency on this front to get NPS in place. Nor is it the case that there is a groundswell of popular pressure that makes doing so a political imperative. On the other hand, the country’s fragile labour markets and the looming threat from the lack of social infrastructure are sufficient reasons to put the foot to the NPS accelerator. The future fiscal burden for the government in transiting from the defined benefit pension system to NPS for government employees is immense. A conservative estimate of India’s implicit pension debt computed by Bhardwaj and Dave in 2006 was $550 billion. Additionally, in the future, the government’s ability to shoulder the fiscal cost of supporting the uninsured aged directly through social assistance and other programmes will, therefore, be limited. At the same time, the social costs of not doing so would be politically unsustainable. Between this rock and hard place is a breakdown of traditional family support arrangements that have carried the burden of old age support in the past and an increase in nuclear households. Along with this, there has been a significant improvement in longevity, with average life expectancy in India rapidly climbing to the level of (OECD) Organisation for Economic Cooperation and Development countries. What is different today from earlier times is that the Pension Fund and Regulatory Development Authority (PFRDA) has spent the last 18 months in mustering the necessary muscle to attack India’s pension coverage gap. The Central record-keeping facility is in place and the first round of pension fund management licences has been bid and activated. The contours of the market for NPS have been mapped and the first round of market research to size and profile the voluntary demand for private pensions has been completed with more to follow shortly. The regulator is also armed with a conviction and equally deep pockets to mount a national promotion campaign to raise public consciousness on the imperatives of retirement savings. Various tools to sell into the market are being developed and plans to market test options for these purposes are already in train. As a next step, PFRDA can be expected to seek interest from commercial firms such as retail banks and life insurers in providing an NPS sales and distribution platform through which informal sector NPS subscribers will open pension accounts and make regular pension contributions. Once this part of the architecture is in place, it will be all systems go. These developments present opportunities as well as threats for commercial finance providers. The threat is that existing household savings patterns will be materially disturbed by attachment to NPS, and bank and life insurance savings, in particular, may suffer a hit on their traditional business volumes as a result. The opportunities are that the chosen few who partner with NPS in the first round will get ground floor positioning in a market that inevitably will grow to mammoth proportions in the future. The waking pension market also will present finance firms with opportunities to ride the wave of interest in retirement savings that PFRDA will create by offering pension products of their own to increasing numbers of interested parties. If the experience in other countries is any guide, equity markets and mutual funds can expect better traction among small investors in future because pension schemes of the sort represented by NPS introduce large numbers of people to the value of investing more generally in equity markets. In parallel, the government can be expected to continue to review the situation with respect to the $100 billion of existing retirement savings to produce a more integrated and consistent retirement incomes policy for India.